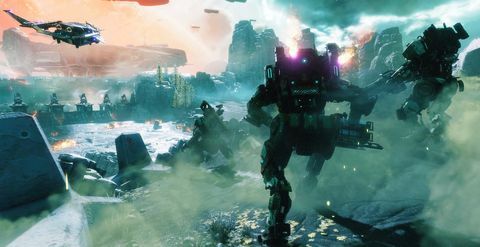 Matt goes hands-on with Respawn's mech-centric sequel at EA Play in Los Angeles. Titanfall seemed to drop off the radar faster than it should have. A cracking multiplayer FPS that eventually found an audience of 10 million, it was possibly hamstrung by a smaller-than-expected Xbox One install base at launch. However, the main complaint appeared to be that the game was too thin content-wise. When the first maps DLC dropped from orbit, it also split the player base, and server populations dwindled as a result. That desire had the design team fiddling with things like projectile weapons, but also adding a fully-fledged and “meaty” single player campaign, written by Modern Warfare and Battlefield 4 scribe Jesse Stern. 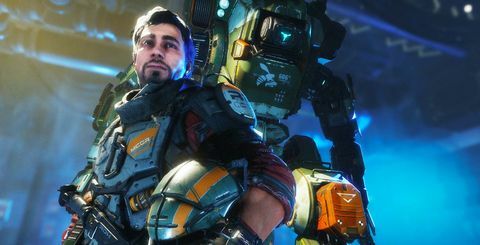 It has been described as a tale of grand global colonial warfare or a retelling of the American Revolution and the American Civil War in space, but there are other things going on as well – ideas that game director Steve Fukuda tells me have floated around in the ether since Respawn began back in 2010. The trailer echoes Asimov’s three laws of robotics, and sure enough, the campaign will explore the unique, dynamic relationship between Pilot and Titan. But there is also an element of the old fable of the boy who meets a lion with a thorn in its paw. The strange creatures populating the maps of the first title also turn with a larger role. “There a lot of robots you’re seeing, all these enemies that are mechanical in nature, so to try and balance that out and give a bit of variety, we thought ‘Why don’t we get something that paints a dangerous world, but presents something more organic?’,” Fukuda explains. So is there more than one protagonist? The team can’t comment, but their reaction seems to all but confirm that yes there is. My hands-on session was with the game’s multiplayer mode on a new map called Boomtown – an underground facility for the Interstellar Manufacturing Corporation comprised of a dense collection of buildings great for hiding in as a pilot, surrounded by open fields great for stomping through as a Titan. The selected mode was Bounty Hunt, a new 5v5 battle where crippled Titans must be destroyed, and the only way to call down your own mech is to kill AI or enemies – there is no Titan timer. 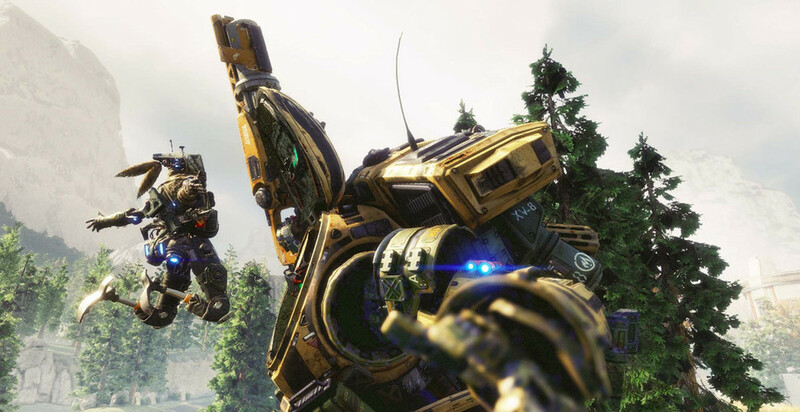 "we still want every ability to be unique and have its own gameplay pattern"
Presumably running on PC, it’s as fast as fluid as you’d expect (it will run at 60 fps on consoles and up to 144 on PC), and the new grappling hook makes getting around as pilots and avoiding Titans even easier. Still, the giant robots are the star, and we have access to two new models: Scorch and Ion. The former sets fire to everything via various launchers and flammable canisters, and is great for area denial. The latter is a trickier class whose offensive and defensive capabilities are all governed by a recharging power source, making energy management paramount. There may only be five players on each side, but it’s chaos in the best possible way. After the requisite dash to the dropship, we take off our headsets and walk outside. Some look wired or overwhelmed, but everyone seems happy with the game. 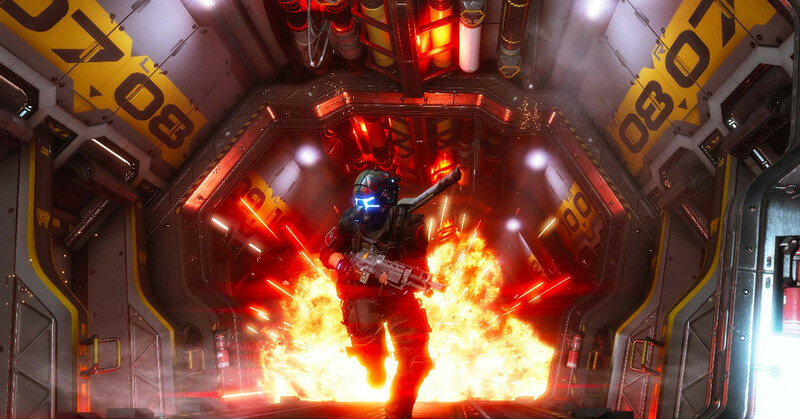 The divisive smart pistol – a gun that many told Respawn allowed them to compete in a competitive FPS for the first time – is back, but the studio is saying precious little else about the game. My inquiries about burn cards, PlayStation VR, and the in-development TV series are met with silence. Still, after the first game and a fleeting but exhilarating round on the second, it’s easy to believe Respawn has it all in hand.